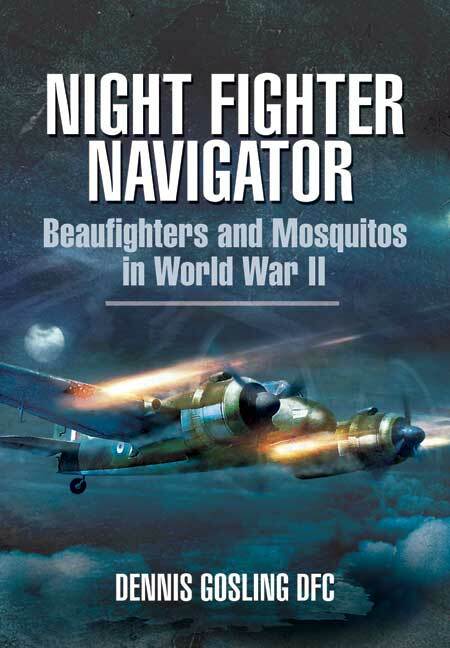 You'll be £19.99 closer to your next £10.00 credit when you purchase Night Fighter Navigator. What's this? horrific scenario of almost constant bombing raids by the Luftwaffe and Italian Air Force. Because of these raids the damage to aircraft on the ground was devastating and the Flight was often reduced to a single serviceable aircraft. His first success came in April 1942 with a confirmed kill, and then shortly after his 21st birthday on 13 May a triumphant night on the 17th brought 3 certain kills and one damaged enemy aircraft. From being the virgins of the squadron they shot into the record books, his pilot being awarded the DFC. To his disgust, Flight Sergeant Gosling received no award. At this stage he became somewhat embittered by the class system he felt was operated by the RAF. Having endured the torment of constant bombardment, serious stomach complaints (even flying with a bucket in the aircraft) and near starvation he completed his tour and was repatriated to the UK via Brazil and Canada in the Queen Mary. After a spell instructing new night navigators, he joined 604 Squadron and in December 1943 he was promoted to Warrant Officer. February 1944 saw the squadron reequipped with the Mosquito and assignment to 2 Tactical Air Force in preparation for D-Day. Now once again he was flying initially over southern England and the Channel. The squadron became mobile after the landings and were based in various captured airfields in France, but the conditions were so inadequate for operations that the squadron returned to English bases, from where they operated over and beyond the advancing Allied troops. Eventually, after having been awarded a much deserved DFC, he accepted the King's Commission. This autobiography is written as stated by the author "I want my readers to relive my experiences as they happened to me - to take their hands and have them walk beside me. I want them to feel the joy and the pain, share the laughs and the heartache, take pleasure in the triumphs, agonise with me when things went wrong and understand why my Service years influenced so much of my life." He has succeeded magnificently. The memoirs continue to come out and this one is a very readable account of someone who started in 1940 training as a wireless-operator/air gunner and became involved in Al radar before going to 219 Squadron at Tangmere and Beaufighters. From there, he went to Honeybourne in preparation for ferrying the first Beaufighters to the Middle East, having done a navigation course. After an unhappy period in Egypt he took one of the 1435 Flight aircraft to Malta as the island's first night defence. While operating in very difficult conditions during the German blitz on Malta, he managed to navigate his Beaufighter to where the GCI station said there was 'trade' then used Al to position his pilot where he could press the trigger. Having shot down five enemy night bombers this way, the pilot was awarded DFC. The navigator got nothing. It was later found out that the combat records submitted by the pilot never mentioned having a navigator/radar operator aboard! Conditions were hard for everyone on Malta in the first half of 1942 and eventually after attacks of dysentery and general malnutrition, he was evacuated on a Lodestar to Egypt. There he boarded the 'Queen Mary' and proceeded on what seemed a luxury voyage to Cape Town, Rio de Janeiro and New York before going to a transit camp in Canada to await transport in a convoy to the UK. His next squadron was No.604. After night patrols over Normandy, and a few more kills, he got his DFC and ended up as a flight Lieutenant. This is a good account of a wartime career and the snags that came up during it. Starting out as an AC2, he met the resistance of the old-established regime during interviews, who could not envisage the son of a bus driver, and with a yorkshire accident, ever fitting into the Officers' Mess. Fortunately this was not the rule at squadron level but he left the RAF in 1946. Dennis Gosling joined the RAF on 24 May 1940. It was the start of a fascinating wartime career. The author explains that through this autobiography he wants others to relive his "experiences as they happened... I want them to feel the joy and the pain, share the laughs and the heartache, take pleasure in the triumphs..." it is an aim in which he has succeeded. This is a good account of a wartime career and the snags that came up during it. Well written biography of a Beaufighter (later Mossie) nav rad in Malta and later over NW Europe. Good read (I found his accounts of night fighting over Malta particularly interesting). A particularly interesting account and an intriguing work. Compelling...It is a quietly heroic tale of great courage. I have read the transcript of this book, and found it to be an excellent read. It starts with Dennis life as a school boy, and him joining the RAF against the wishes of his parents. Dennis takes you though his life in the RAF to Malta, and the hardship & turmoil that followed. A truly magnificent achievement, and I was totally enthralled by the transcript. I have read the transcript of this book, and found it to be an excellent read. It starts with Dennis life as a school boy, and him joining the RAF against the wishes of his parents. Dennis takes you through his life in the RAF to Malta, and the hardship & turmoil that followed.